India’s growing affluence has led experts to predict a major rearmament effort. The second-most populous nation in the world is beginning to wield the economic power expected of such a behemoth. Its border with Pakistan is a tinderbox, the subcontinent remains vulnerable to religious extremism, and a military rivalry between India and China could erupt in the future. India has long had the motivation for modernizing its military—it now has the resources as well. What should we expect to see in the future, and what will be the likely ramifications? In Arming without Aiming, Stephen P. Cohen and Sunil Dasgupta answer those crucial questions. India’s armed forces want new weapons worth more than $100 billion. But most of these weapons must come from foreign suppliers due to the failure of India’s indigenous research and development. Weapons suppliers from the nations are queuing up in New Delhi. A long relationship between India and Russian manufacturers goes back to the Cold War. More recently, India and Israel have developed strong military trade ties. Now, a new military relationship with the United states has generated the greatest hope for military transformation on India. Against this backdrop of new affluence and newfound access to foreign military technology, Cohen and Dasgupta investigate India’s military modernization to find haphazard military change that lacks political direction, suffers from balkanization of military organization and doctrine, suffers from balkanization of military organization and doctrine, remains limited by narrow prospective planning, and is driven by the pursuit of technology free from military-strategic objectives. The authors argue that the character of military change in India, especially the dysfunction in the political-military establishment with regard to procurement, is ultimately the results of a historical doctrine of strategic restraint in place since the prime ministership of Jawarharlal Nehru. In that context, New Delhi’s approach of arming without stragic purpose remains viable as India seeks great-power accommodation of its rise and does not want to look threatening. The danger lies in its modernization effort precipitating a period of strategic assertion or contributing to misperception of India’s intentions by Pakistan and China, its two most immediate rivals. Stephen P. Cohen is senior fellow in Foreign policy Studies at the Brookings Institution. He is the author of numerous books, including The Idea of Pakistan and India: Emerging Power (both with Brookings). Sunil Dasgupta is director of the University of Maryland, Baltimore Country’s Political Science programme at The Universities at Shady Grove, and also a non-resident fellow in Foreign Policy Studies at Brookings. He also spent five years as senior correspondent for India Today. There is widespread acknowledgment that India is newly important. Whether emerging, rising, or an Asian "giant," there is some expectation that India's new affluence will enable it to deploy vastly improved armed forces. This expanded military capability will enable it, then, to play a larger role in world affairs, notably in Asia, and to more effectively address military challenges both abroad and at home. While India's historical poverty would seem to explain why it has not developed its military power, several studies have suggested reasons for why this is not the case, and why India has not been able to alter its strategic condition. In a very influential analysis in the 1990s, American strategist George Tanham argued that India had problems developing a robust security policy, including a strong military force, because the country was bereft of coherent strategic thought. I Tanham attributed this missing piece to internal divisions in Indian society, which left a small elite responsible for strategic matters. Cut off from the rest of society, this elite was unable to mobilize available resources into military power. The result was repeated invasions of India over the last millennium. Stephen Peter Rosen argued that internal social divisions in India prevented collective action necessary for strong defense.' He argued that the British had been able to raise an extraordinarily effective Indian Army by isolating the armed forces from the divisions of society. While it was possible for an independent government in India to do the same, a democratic India committed to egalitarian values and proper representation in the services would be hard-pressed to maintain a military set apart from the rest of society. In contrast, the Indian scholar Rajesh M. Basrur has emphasized political choices and ideological preferences.' Indian leaders, he says, preferred to view security as a political rather than a military matter and consistently made choices that downplayed military aspects such as nuclear weapons in favor of political management of security issues. Recent writing on India, drawing on the first period of sustained economic growth in the history of independent India, expects dramatic changes in how the country demonstrates its national power." Ashley Tellis, an American strategist who has been central to the reordering of U.S.-India ties, writes, "The record thus far amply substantiates the claim that India will be one of Asia's two major ascending powers. It is expected that the Indian economy could grow at a rate of 7 to 8 percent for the next two decades. If these expectations are borne out, there is little doubt that India will overtake cur- rent giants." Tellis has concurred with Central Intelligence Agency assessments that India will be the fourth most "capable concentration of power" after the United States, the European Union, and China." The assumption here is that India will continue to grow rapidly and that fast growth, which will give the country the wherewithal to function as a great power, reiterates the traditionally realist affluence theory that wealth and military power go hand-in-hand. Rodney Jones, for example, finds that between 1990 and 2003 India's ability to conduct combined arms operations against Pakistan improved dramatically, giving India a 3:1 advantage in military capacity.' Several observers, from Singapore diplomat Kishore Mahbubani to American strategic thinker and journalist Fareed Zakaria, see India as part of the gravitational shift eastward to Asia. B Ambassador Teresita Schaffer notes that India is dramatically changing its outlook toward the world and is envisioning itself as a world power, with an expanding economy and greater engagement in global governance. In contrast, neorealists such as Kenneth Waltz have emphasized threat over resources. 10 States reorder their priorities when threatened, irrespective of their economic condition. Poor societies are quite capable of generating military power sufficient to frustrate and even defeat wealthier nations with bigger and better-equipped armies. 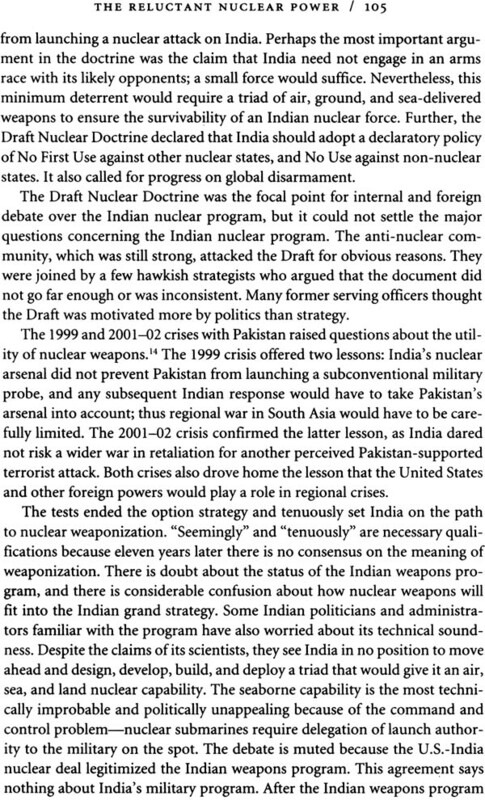 In this view, India's 1998 nuclear tests were driven by its security concerns about the rising threats from Pakistan and China and established that India was willing to pay for the ability to secure its interests. On the other hand, richer societies may hold back their military spending to curb arms races; here politicians pursue political security rather than military power alone. Both India's nonalignment and nuclear weapons programs, for example, have deviated from the predictions of the affluence theory. Its nonalignment during the cold war was the legacy of its colonial history and defined by its ability to playoff the United States and the Soviet Union. Further, its nuclear program sought to preserve its nuclear options while trying not to antagonize other great powers. When the tests occurred in 1974 and 1998, the circumstances were extraordinary. Certainly, the testing decisions had little to do with India's affluence at the time. The preeminence of threat in determining the direction and content of military modernization is subject to debate as well. Over the last two decades, the military threat to-India has changed dramatically toward unconventional war, but the nation's armed forces and national security decision making structure appear not to have made insurgency and terrorism the centerpiece of the military modernization effort. Advanced conventional weapons such as fighter aircraft, tanks, and aircraft carriers heavily dominate India's wish list even though they have tenuous influence on the problems of insurgency and terrorism. Doctrinal changes have sought to extend conventional deterrence to sub-conventional conflict. However, the prospects of extending deterrence to insurgency and terrorism and especially the difficulty the Indian Army has had in going from conventional war preparation to counterinsurgency and back demonstrates the difficulties of moving large organizations, especially without strong direction from the political leadership. Juli MacDonald has taken a critical view of the Indian military establishment, especially of the ability of the armed forces to modernize meaningfully. The American scholar Amit Gupta argues that the structural context of India's modernization efforts is critical." He argues that regional powers such as India suffer from uneven development because they live on a feast or famine cycle of funding and access to foreign technology and weapons. Doctrinal development is erratic as the services scramble to fit their strategies to available weapons; their armed forces do not have the balance of the great powers. Meanwhile, at home regional powers have focused energies on unconventional technologies such as nuclear weapons to minimize the consequences of their weak conventional militaries. Others have written mournfully or scornfully of the absence of creative Indian strategic thought, especially among civilians, returning to the theme explored by Tanham earlier. Former Indian defense and foreign minister Jaswant Singh says that unless India as a society comes together more effectively, it is unlikely to generate the requisite military power to pursue an active security policy. Indian scholar Harsh Pant argues that in the absence of strategic thinking, economic growth has become a surrogate for national strategy. All of these explanations with their separate focuses—culture, society, political will, poverty, strategic environment-capture some of the truth. In our view India's deeply ingrained tradition of strategic restraint most powerfully explains the puzzling inability of the Indian state to generate sufficient military power to alter its strategic position vis-a-vis Pakistan or China. We see the restraint as deliberate, the result of Indian political leaders deciding that (1) the international environment was at least somewhat benign, or put another way, that India had the possibility of politically man- aging its threat; (2) the balance of resource allocation between defense and development had to favor the latter; and (3) there must be an ideological rejection of armed force as an instrument of state policy, a view stemming from the colonial experience and the great-power politics in which India became independent in 1947. While expensive and redundant, India's approach of arming without strategic purpose is not without wisdom. The political preference of restraint has wisely sought to escape the security dilemma rather than embrace it. It is because of strategic restraint that other great powers in the world are facilitating, rather than fretting over, India's current rearmament, which is one of the biggest peacetime efforts by any developing country in recent history. But strategic restraint also contributes to the astounding lack of political direction in Indian efforts at military modernization. India's most eminent strategic thinker, K. Subrahmanyam, has spent most of his career pleading for modernization of the defense and strategic policy process. While Subrahmanyam has strong interests in weapons modernization (he was the leading advocate for many years of going nuclear), much of his wrath has been directed at the antiquated system by which India formulates strategic policy, makes weapons decisions, and manages the entire defense policy process. India's armed forces have long disagreed with strategic restraint as a viable position in defense policy. The country's rapidly growing strategic community would like to use India's newfound affluence and access to technology to achieve military transformation, but there is tension here and it is not clear that the new forces of change will prevail. On the one hand, India's new affluence and the nuclear tests of 1998 raise hopes that the country will break out of its strategic restraint-and assume its place as a great power." On the other, India's military modernization has lacked political direction and has suffered from weak prospective planning, individual service-centered doctrines, and a disconnect between strategic objectives and the pursuit of new technology. The haphazard character of military change in India suggests that the country's historical preference for strategic restraint remains firmly in place. No country in the world succeeds in all dimensions of military power all of the time. However, it is not so much the standard that is important, but the capability of a country compared to others, especially those with whom it could fight wars. In India's case the most likely state is Pakistan, followed by China, but there is also the possibility of military use elsewhere in the region, especially against nonstate actors. India's military power must be understood in the context of these potential calls to armed service.